You want to be a master painter? In Pigment, from Copper Frog Games, you can be. Send your apprentices out to collect or trade “pigment” cubes (red, yellow, blue). Then spend them in the right combination to paint Renaissance masterpieces. Listen to our review in about 6 minutes, or read on below. 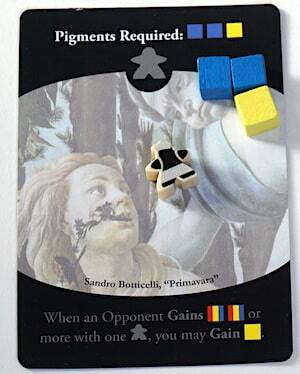 In this light game, players take turns sending their apprentice meeples out to the “bazaar” to get pigment cubes, or sometimes trade one pigment cube for two or more. Once you have enough pigment cubes, you can use those pigments and an apprentice to paint one of the available paintings. Pigment combines worker placement with just a little bit of engine building. Each painting gives a special ability, but only while it is the topmost (most recent). Sometimes that’s an exclusive bazaar stall, sometimes it’s a discount on your next painting, and sometimes you’ll receive extra cubes based on an action that another player takes. 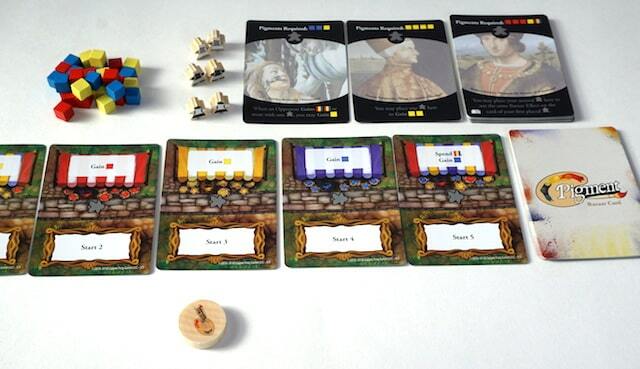 In the two or three player game, Pigment is a race to be the first to complete 6 paintings. There’s also a solo mode (called “speed painting”), in which you race against an AI who automatically receives 3 random cubes each round. Every round, the last stall rolls off the end of the bazaar and a new stall is added. It’s one way that Pigment adds variety, but it also keeps players from planning out a strategy too far in advance. We find the theme very interesting, and it has beautiful Renaissance art. We think it could be a good introduction to worker placement and engine building, but more for non-gamer adults than for children. There’s no hidden information, and just a few early decisions will often determine the winner. The tiny meeples look like painters. They are super cute, and they’re each a combination of black, white, and gray. Their small size and difference between front and back makes them hard to tell apart. There’s a lot of nice elements in Pigment, but it leaves us wanting a little bit more. At $15, it is a decent, fast introduction to worker placement, and would also be a good choice for an art lover. The Family Gamers received a complimentary copy of Pigment from Copper Frog Games for this review. You Bred Raptors? provided our end bump music: “Avalanche”.